Somerset: Meteor at Midnight, Glastonbury Tor. National Trust name check on BBC Glasto coverage. We are so chuffed to see that we got a Tor t-shirt name-check last night from Mark Radcliffe and Lauren Laverne on the #BBCglasto coverage. Thanks Mark! Well done to Katharine Davies for making this one happen! For those of you wanting to see more of what we’re getting up to on site, check out our Flickr feed. We will get as many pictures up on the main National Trust website, and are tweeting and facebooking to our supporters to encourage them to take a look at this Flickr group to give them a better idea of what we’re up to. We also have a cameraman with us on-site, but until his footage is edited, take a look here to see a short tour of the Outside Inn and find out what we’re offering our visitors….. ( it’s a little shaky, but gives you a good idea of what we’re up to). It’s Saturday today, and we’ve just had a visit from Peter Blake (of Sgt Pepper album cover fame). 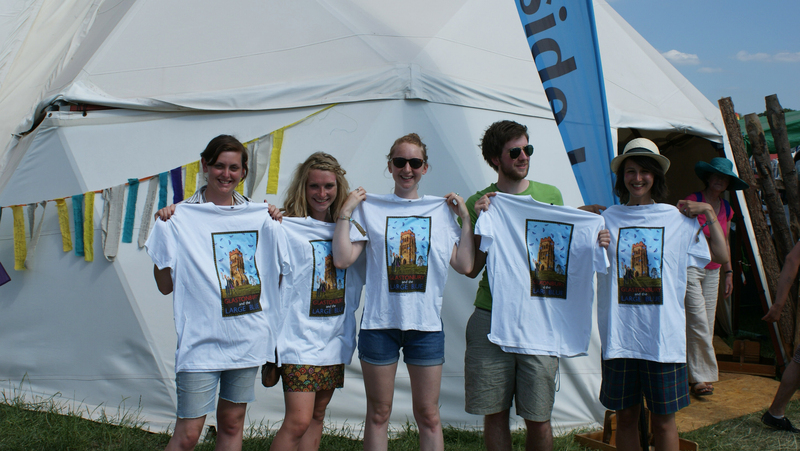 Peter was kind enough to design a t-shirt for us, which we’ve been giving away at the festival. Peter also designed a butterfly artwork, which we have turned into stamps. 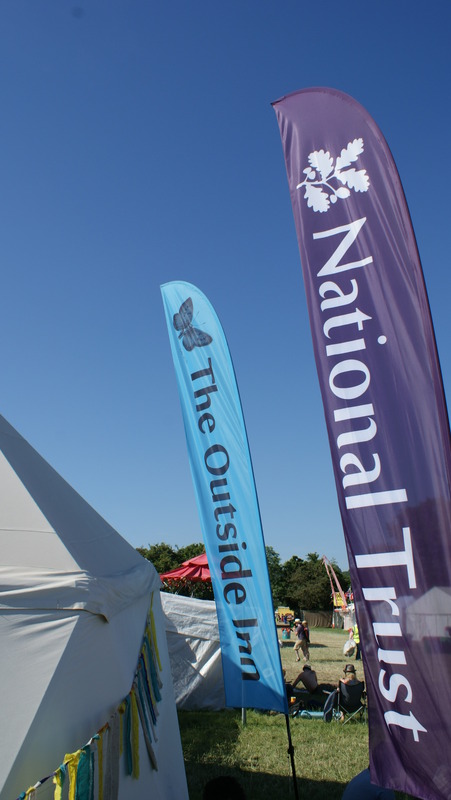 The team have been hard at work stamping festival goers with the butterfly artwork, so that we are able to spread the NT message far and wide around the site. It’s day today today since the crowds arrived, and we’re really pleased with how well everyone is taking to what’s on offer at the Outside Inn. This picture show some of the festival goers lying back and relaxing to the sounds of the National Trust. Best-known for his design for the Beatles’ ‘Sgt Pepper’ album cover, Peter Blake has created a unique artwork around the theme of the iconic Glastonbury Tor. The design shows the 15th century St Michael’s Tower at the summit of the Tor, surrounded by butterflies. Michael Eavis, founder of the Glastonbury Festival, and his daughter Emily have also been incorporated into the design, along with St Michael himself. The design will appear on a series of limited edition T shirts, which will be given away at our Glastonbury Festival stand, Outside Inn, and through the our’s social networking sites across the festival duration. Peter Blake has also created a signed butterfly ‘tattoo’ which will be available as ‘body art’ or as a stamp on programmes or clothing for all festival goers. The butterfly motif was chosen to celebrate the special importance of butterflies to the Glastonbury area, and midsummer as a perfect time to see them. Our work with Peter Blake is among the exciting initiatives in a new programme to commission and promote contemporary art and craft across its historic properties, countryside and coastline.